The DOE proposal is about the “future” of nuclear energy. DOE wants to continue promoting nuclear power plants, continue creating nuclear weapons, continue churning out nuclear waste. Without disposal, there is no future. We can collectively refuse. Sane people want to know: how can there be “disposal” for something that lasts millions or billions of years? What would it take for you to consent to accept nuclear waste in your region? The Department of Energy (DOE) wants to know. DOE has held 9 public meetings across the country this year, and is now taking written comments, on the concept of public “consent” to accept high-level radioactive waste. Send DOE your comment today: No more nuclear waste – No Fukushima Freeways! After decades of trying to force-feed the proposed Yucca Mountain nuclear dump down the throats of Nevadans and the Western Shoshone Nation, the DOE and nuclear proponents now want to know what it will take to get people to “consent,” or at least appear to consent, to take nuclear waste in their communities. DOE acknowledges this is also “consent” to future nuclear waste production as part of setting up an “integrated waste management system.” The federal agency says that the future of nuclear energy in this country depends on this. Tell DOE what you think of nuclear waste by clicking here. DOE seeks public input on how to be FAIR, WHO to include in the consent process, and what RESOURCES it will take to induce community participation in the nation’s radioactive waste program. DOE wants to identify who adequately represents a community and will consent to take nuclear waste on its behalf. DOE is not defining exactly what or how much nuclear waste we would be “consenting” or not consenting to accept. And DOE is not asking how a community can refuse or express permanent “non-consent,” although you can let them know that if you choose to. Although they have reports, diagrams of storage containers and systems, ideas and plans for the tens of thousands of tons of nuclear waste in this country, they claim to want to negotiate with communities who would “consent” to take it forever or supposedly temporarily. No consideration of the rights or consent of communities along transport routes is being made or requested. Although one of the greatest dangers to the most people, environments and ecosystems is the movement of tens of thousands of tons of nuclear waste on roads, rails and waterways, DOE has stated that there is complete federal preemption over transport of nuclear waste, so states and communities along the transport routes would have no voice, no matter how much waste DOE plans to move through them. DOE is giving no consideration of the rights of future generations who will inevitably be affected. 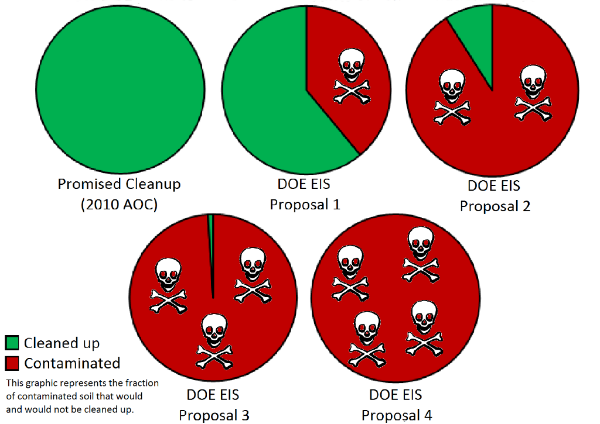 DOE and the nuclear industry are eager for volunteering or consenting communities to take the waste and for the DOE to take title to it–absolving the industry of responsibility for managing the waste it creates before there is even a proven solution for its long-term management. Click here to read a Federal Register notice that explains more about DOE’s request for public comment on these issues. There is also information on this DOE website. You can contact Diane D’Arrigo or Mary Olson at NIRS for more information about the other meetings and the issue generally. Submit a Public Comment! We encourage everyone to submit your own thoughts on these issues to DOE. Comment deadline is July 31, 2016. Please send an email to consentbasedsiting@hq.doe.gov. Please include “Response to IPC” in the subject line. — Idaho: Ready to give “consent” to allow more commercial nuclear waste? Longtime Idahoans remember being shocked some 40 years ago when it was revealed the INL was dumping radioactive waste water directly into the volcanic, porous ground above the Snake River Aquifer; the source of our agricultural irrigation and the water supply for thousands. Many have seen the pictures from the ’70s of trucks dumping blue barrels full of transuranic waste into ditches at the site. Public outcry stopped those specific practices. But that waste is still there. Radioactive isotopes have leached into the aquifer. Tons and tons of other people’s nuclear waste kept arriving. In 1995 Gov. Phil Batt worked a deal with the U.S. Department of Energy: In exchange for a limited amount of new military waste shipments (the “nuclear Navy,” Three Mile Island, etc.) the DOE would: 1) Build a permanent site for those (and previous) shipments, and 2) Clean up the mess that was already there. The agreed-to shipments began to arrive. Neither the permanent storage nor the cleanup has happened. The military waste shipments that were allowed into Idaho continue to this day; I saw new shipments in rail cars at the Pocatello yard two weeks ago. Many of us anti-nuclear types, including the Snake River Alliance, opposed the Batt 1995 Agreement at the time, believing it was too weak; it allowed for too much waste and caved in to the Feds. Now, those same forces want to get rid of the Batt Agreement altogether; not because it’s too weak, but because it’s too strong. It doesn’t allow enough waste in. It commits the feds and our state to clean-up. Apparently, they want more waste, with no permanent repository in sight, and they want it without a commitment for cleanup. They want to throw out the people’s referendum vote. The governor has used state dollars to support this campaign by creating the Leaders In Nuclear Energy (LINE) Commission. One of the appointed members is Larry Craig. The meeting is being held 5 to 9:30 p.m., at the Boise Centre on the Grove. The public is invited to listen, ask questions and comment. Brent Marchbanks is a retired lawyer and longtime Boise resident. He remains active in social issues.